It came to my attention earlier this week that while I have been blogging quite a lot for work, it has been some time since I wrote anything on here in relation to law and sport which was the very purpose for me starting this blog in the first place many moons ago. So what better time to get back on the horse – so to speak – than with the news that Jack Wilshere has received a two game ban from the FA for the above salute to Manchester City’s supporters last weekend. Television cameras picked up Wilshere – rather foolishly – raising his middle finger in the direction of home supporters at the Etihad Stadium during the second half of Arsenal’s 6-3 Barclays Premier League defeat last Saturday. Now while I do not condone Wilshere’s actions and genuinely agree with the views of Arsenal’s Godfather of blogging, Arseblog, on the subject – I do think that the punishment may well benefit the game as a whole but only if it is applied proportionately and consistently by the authorities. Arsenal’s Jack Wilshere has been suspended for two matches by an Independent Regulatory Commission. Wilshere was charged by The FA with making an offensive and/or insulting and/or abusive gesture during the fixture between Manchester City and Arsenal at the Etihad Stadium on Saturday 14 December. The incident was not seen by match officials but was caught on video. 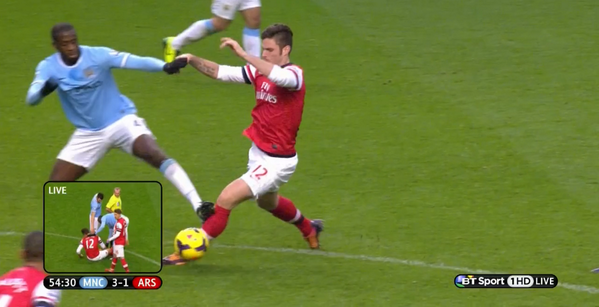 Whilst admitting the charge, Wilshere claimed the standard sanction for this offence was clearly excessive. The Commission rejected this claim and the two match suspension will commence with immediate effect. The Twittersphere has been awash in the last few days stewing at the apparent inconsistent, duplicity, or downright corruptness – depending upon whom you speak to – that is the paradoxical FA. Many have drawn out from the bowels of YouTube prior instances from years ago concerning footballers at other clubs making similar gestures that were never penalised by the authorities either on or off the pitch. Of course the important thing to remember here is that this is a new pilot scheme which has already set some precedent with Blackpool winger Tom Ince being retrospectively charged and banned for two games in relation to a verbal gesture towards a match official in a Capital One Cup tie against Preston earlier this season. Of course some prefer to look to everyone’s favourite Uruguayan, Luis Suarez, who back in December 2011 received a one match suspension, fined £20,000 and warned as to his future conduct after he made a gesture to home fans while walking off the pitch following a 1-0 defeat at Fulham. Wilshere’s argument certainly seems to have been ‘why should I receive double the punishment?’ and I do have some sympathy with him there. The real dirty truth is that football fans have been crying out for retrospective punishment for years whether it be for horror tackles, diving or Wilshere’s own brand of “fan engagement”. When it is not your player you want a ban to teach “them” a lesson and “save” the beautiful game; but when it is not you feel the authorities are unfairly picking on your club. Fans can be punished for their behaviour towards players so there must be some degree of reciprocality, although I of course accept the inherent difficulties of trying to pursue several thousand fans for making obscene gestures to footballers during the space of 90 minutes. Again, I would suggest that there should be proportionality and consistency by the authorities, there should be a definable scale for retrospective punishment with the worst offences leading to the longest suspensions or fines. It is of course important that the rules of the game are understood, adhered to, and perhaps most important of all, are transparent for both clubs, players and fans. FA chairman Greg Dyke said in October: “It is understandably baffling to everyone and must be addressed. As FA chairman I don’t like being in a position where I can’t explain why we can’t take action.” Any FA disciplinary panel should be transparent as to why they either do or do not pursue a retrospective action, and also give their full reasoning as to why any appeal, whether outright or merely a plea in mitigation should be rejected – that hasn’t happened here as the FA’s statement above shows. To be honest neither will I, but maybe the FA will surprise us. After all it is Christmas time and miracles are supposed to happen.